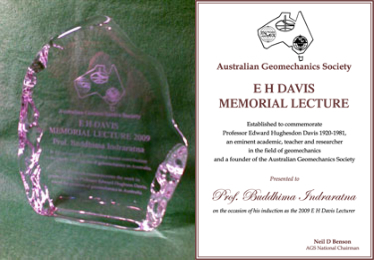 The lecturer is a person selected by the National Committee as having made a distinguished recent advancement to geomechanics knowledge in Australia. Nominations should be made through the Chapter Committees, or by individuals, to the secretary of the National Committee, following a call for submissions in Australian Geomechanics. Determination of the award is by a subcommittee of the National Committee. The nominee is expected to be a member of the Australian Geomechanics Society. In the first instance, the Lecturer’s presentation is made separately to a meeting of members of the Sydney Chapter and the Victorian Chapter of the Society. At one of those meetings, the award memento will be presented by the National Committee, or as otherwise arranged. The memento consists of a framed certificate and a glass plaque. The Lecture may be presented at other Chapter meetings, subject to individual arrangements. The award was first made in 1985.